It’s no easy task to create one of the largest networks of telemedicine providers in the nation. But, 1.800MD has done just that, to make convenient care anywhere possible. Available at any time day or night, our board-certified physicians are equipped to communicate while you are in the comforts of your home, office or business trip destination to diagnose, recommend treatment and prescribe medications. You can trust in the experience 1.800MD’s medical team will deliver. Each physician is credentialed by the highest standards. 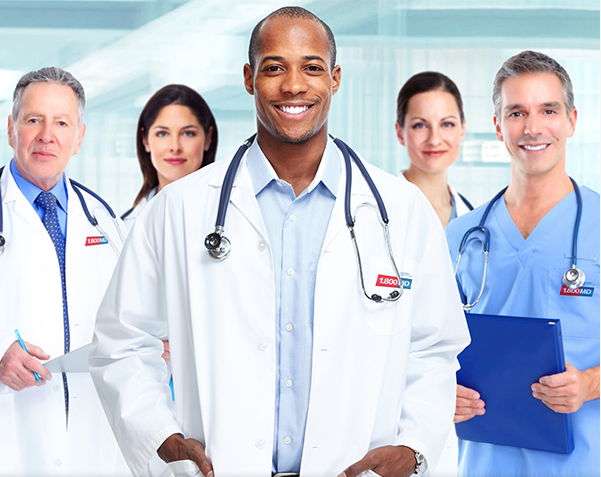 A thorough review of medical licensure, training, education, work and malpractice history is performed every two years by a national third party credentialing agency in accordance with the National Committee for Quality Assurance (NCQA) and the Utilization Review Accreditation Committee (URAC) guidelines. 1.800MD physicians are available to diagnosis and treat common ailments such as allergies, arthritic pain, flu symptoms, sinusitis, bronchitis, gastroenteritis, minor burns, respiratory infection, sore throat, sprain or strain, urinary tract infection and many more non-emergency medical illnesses. With an average of 15 years of internal medicine, family practice and pediatrics experience, you can rest assured each physician is properly licensed in the state you live, board-certified and verified by the National Physician Data Base and the American Medical Association. 1.800MD provides extensive training in telehealth to ensure each physician can provide the quality care you expect.